This church is thought to have been the place where the idea of the Romanesque porticoed gallery was first conceived. 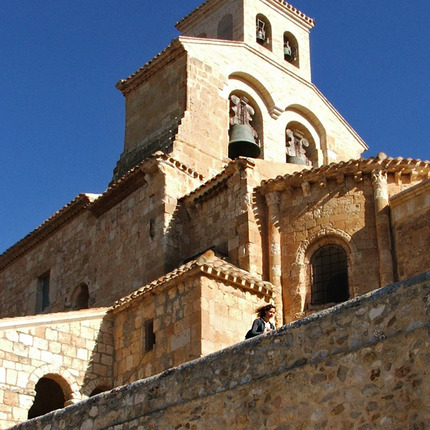 This extraordinarily lovely architectural solution was to spread to the Romanesque constructions of Segovia and Soria. It is a rustic church of modest dimensions, built of masonry work reinforced with stone at the corners. It has a nave, presbytery and semicircular apse, barrel vaults and wooden roofs, and a square tower in two sections adjoining the north wall. The doorway has three semicircular archivolts decorated with batons, on four columns with crudely carved capitals. The most important element is the porticoed gallery protecting it, and particularly for reason of its age (the church was consecrated in 1080). It has seven semicircular arches –including the central entrance archway– supported by simple columns. The carvings on the capitals feature a range of motifs: turkeys, Muslim figures, a city with battlements, and a chessboard design. On the interior, the capitals of the triumphal arch depict horses and lions.